Went up to the Jurby Transport Museum on Sunday (16/10/11) to have a look at the stock of vintage transport that are on show, I have to say that the guys up there are doing a fantastic job in maintaining our heritage for all to see. 697 HMN was one of three Leyland Leopard buses built in April 1967 for Isle of Man Road Services Ltd. Originally fitted with 41 coach seats, it entered service on 13 June and completed its public service on the 8th February 1986. This bus has been restored to an absolute pristine condition and I would recommend a trip up to Jurby to see all the fantastic exhibits. Hello Peter, the museum was actually opened around Easter 2010. I visited in August 2010, and was amazed to see how much had been achieved in a very short time. The building was almost bursting at the seams with a wide variety of transport items. 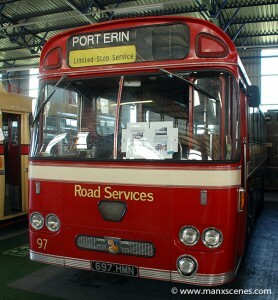 Busses were the main feature of the display, but the Ramsey pier railway and Douglas horse trams were also represented. A very worthwhile addition to the Manx transport scene.